In Everybody Matters, CEO Bob Chapman and bestselling author Raj Sisodia challenge traditional thinking about how to run a business and how to be an inspirational leader. Starting in 1997, Barry-Wehmiller CEO Bob Chapman has pioneered a dramatically different approach to leadership that creates off-the-charts morale, loyalty, creativity, and business performance. At Barry-Wehmiller, every single person matters, just like in a family. That's not a cliche on a mission statement; it's the bedrock of the company's success. In Everybody Matters, Chapman and co-author Raj Sisodia show how any organization can stop viewing its employees are simply func-tions, to be moved around, 'managed' with carrots and sticks, or discarded at will. By doing so, disengaged workers begin to share their gifts and talents toward a shared future. Uninspired workers stop feeling that their jobs have no meaning. And everyone stops counting the minutes until it's time to go home. 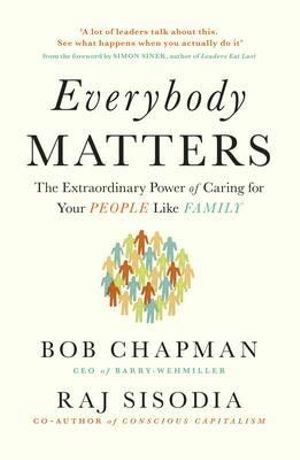 Everybody Matters chronicles Chapman's journey to find his true calling and provides clear steps to transform your own workplace, whether you lead two people or two hundred thousand.